What comes to your mind the minute you hear Delhi weddings?! Band Baajaa Baaraat, Tanu Weds Manu or Dev D wedding scenes?! With baandwalas in the background, Punjabi dhol-tasha, ladies clad in exquisite patialas and lehenga choli, daaru-shaaru – you get the picture. North Indian weddings are simply over-the-top! To match the level of all the show-shaa involved in Delhi weddings, couples (or rather the couples’ parents) don’t settle for anything low than a 5 star hotel to host their grand weddings. While 5 star hotels provide all the amenities to nail your D-Day. There are these certain caterer’s food that you couldn’t help but keep running to for three servings and more. Or that Chandi Chowk wala favourite halwai whom you made a pact with while licking your fingers off the delicacies saying “meri shaadi main, toh aapki mithai parosi jayegi”. To help you keep that promise and to have the best-of-the-best caterers at your wedding without compromising on that 5 star wedding you wish to host - today we’ve curated an absolute list for you. 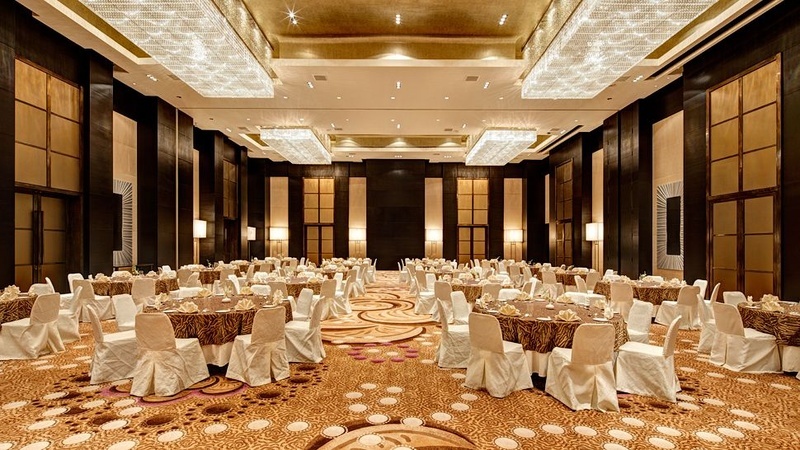 An ultimate list featuring top 5 star banquet halls in Chandigarh that allow you to book your own caterers, pick your choice. Located in Panchkula, Chandigarh, Hotel Bella Vista offers a spectacular view of the Shivaliks and is easily accessible from all parts of the city. The hotel will pamper your outstation guests and make sure that they have an enjoyable time. They have two beautiful banquet halls that are perfect for both pre-wedding and wedding ceremonies. It's a great choice of venue as they take care of the catering and decoration requirements, but also allow outside food and caterers at the venue. Palki Palace-I, Khara-Landran-Road, Chandigarh is a premiere contemporary lifestyle destination that is well-connected to the rest of the city, making it an ideal choice for weddings and other social events. Their spacious banquet is attached to a sprawling lawn and makes a great space for lavish weddings. You can also customize the space by choosing a decorator of your choice. Treat your guests to a lavish meal, whipped up by a caterer of your choice or book your own caterer to serve the delicacies of Delhi and make your day more memorable. Convenient location, impeccable service and hospitable staff make the Holiday Inn Chandigarh Panchkula a great venue for weddings and other social events. The hotel's magnificently appointed rooms & suites offer a comfortable and enjoyable stay for your outstation guests. The Grand Ballroom can be the perfect venue for a lavish wedding and their decorators can ensure a picture perfect space. While their staff takes care of the decor and your guests, you can treat your loved ones to a delicious feast by your own choice of food or caterer at this 5 star banquet hall in Chnadiagrh. Ramada Plaza Chandigarh Zirakpur offers two spacious halls for weddings, pre-wedding ceremonies, anniversaries and other social events. You can choose a hall according to your requirement and occasion and their in-house decorators can customize it to complement the event. They also have efficient in-house chefs who can whip up the perfect wedding day feats for your guests, but the venue does not restrict you from booking your own caterers to serve your guests the best delectable.